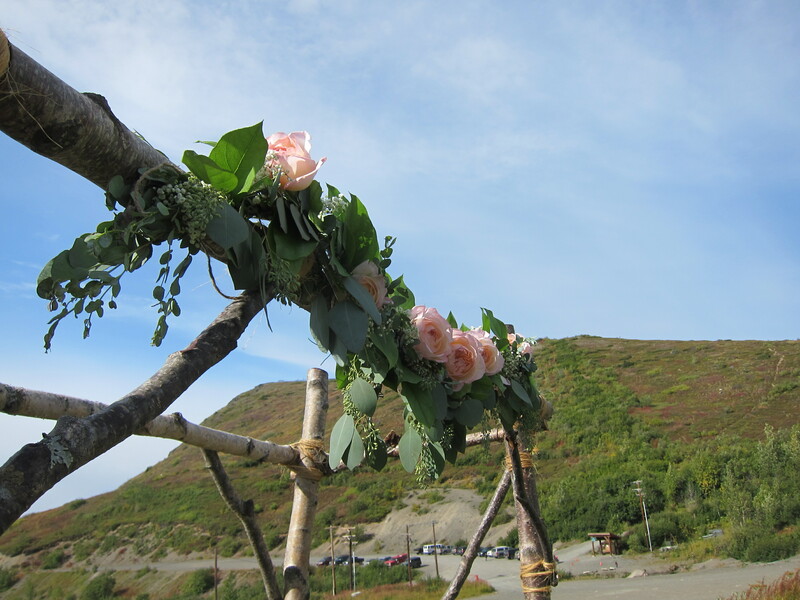 Many brides I work with are Alaskan through and through and ask to have bits of Alaska incorporated into their flowers. This makes my job even more fun because I get to forage from the forest. Today’s wedding was full of forest ferns. Hannah and Dylan’s wedding had a vintage vibe. As I was dropping off the flowers Hannah’s aunt arrived in a black A-line with a fascinator that belonged to her grandmother. Most Anchorage residents would tell you that autumn is here. It arrived last Tuesday, to be precise. There was a nip in the air this morning as I made my way up the windy dirt road to Arctic Valley for my last gig of the wedding season. Cara and Tyler chose a rustic theme for their wedding, which was fitting against the wilderness surrounding the Arctic Valley chalet. 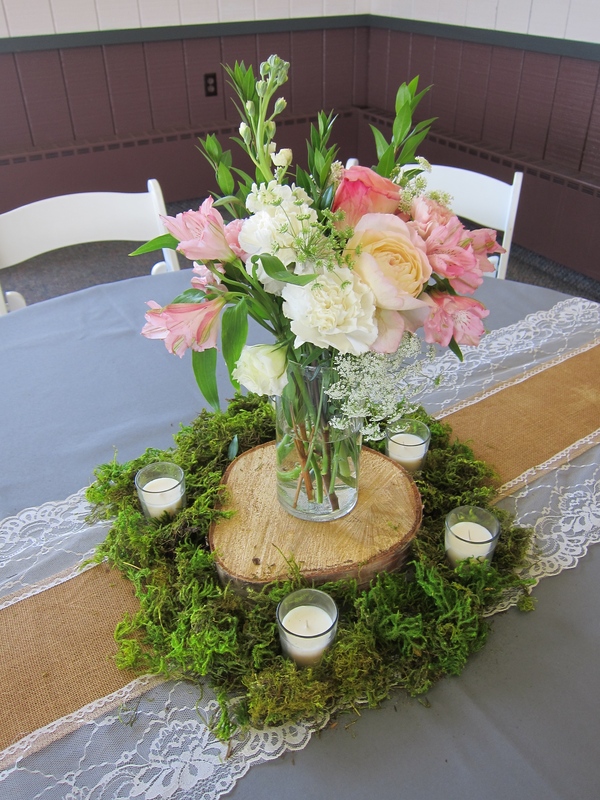 Burlap table runners dressed with vintage lace and slabs of raw birch logs surrounded by moss were just the right touch. 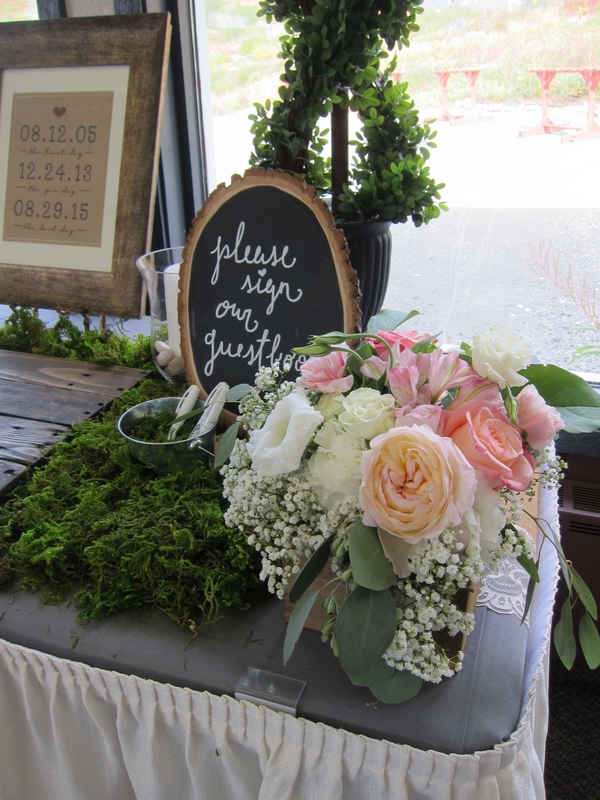 Cara chose pink, blush, white and sage green for the floral arrangements. The shabby-chic color palette complimented the rest of the decor perfectly. 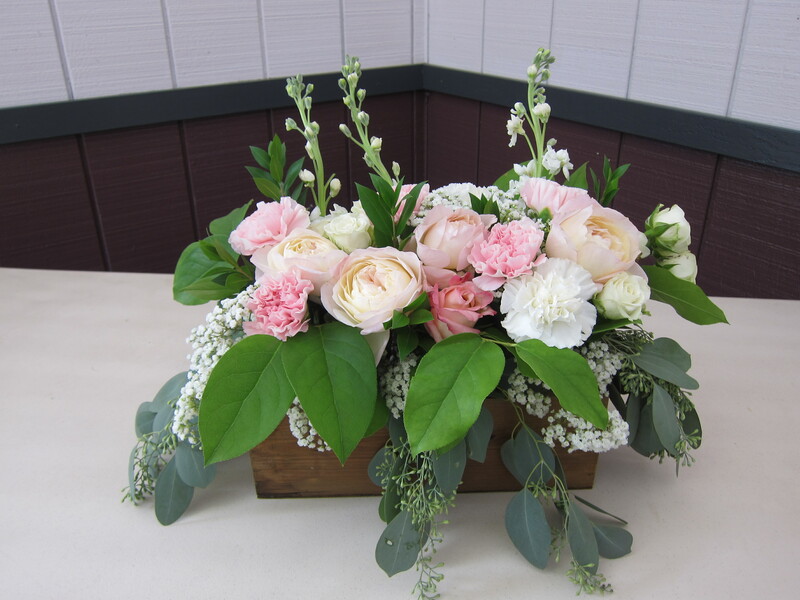 I had the pleasure of working with feather-light garden roses, the color of rosy cheeks on a crisp autumn day. 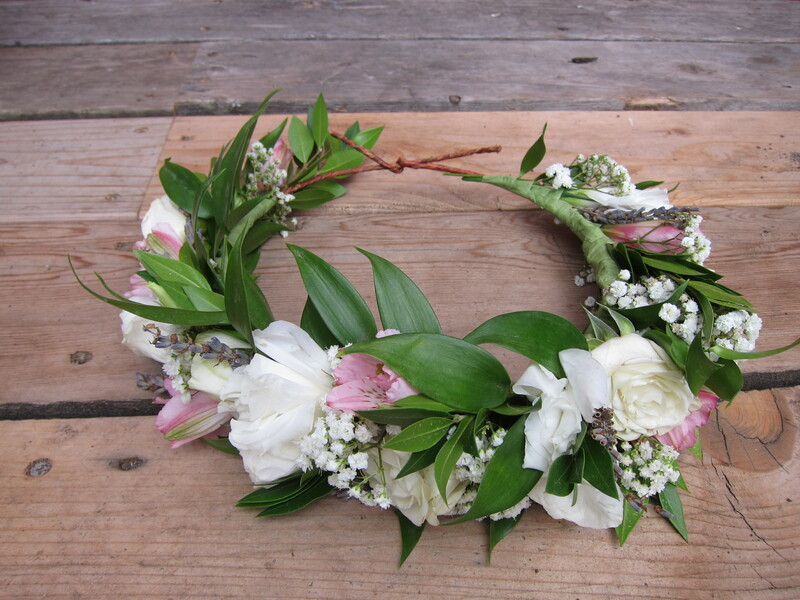 The mother of the bride requested a garland over the birch tree wedding arch, which I was looking forward to creating. It was my first try at a garland and I constructed it sort of like a giant flower crown. I put the garden roses in water tubes and wired them in just before hanging to ensure the blooms lasted as long as possible. What a truly wonderful close to my wedding season. This was a challenging, fun summer. I learned a lot through my experience of being a new florist on my own and I’m grateful to the brides who put their trust in me. I can’t wait for next summer! 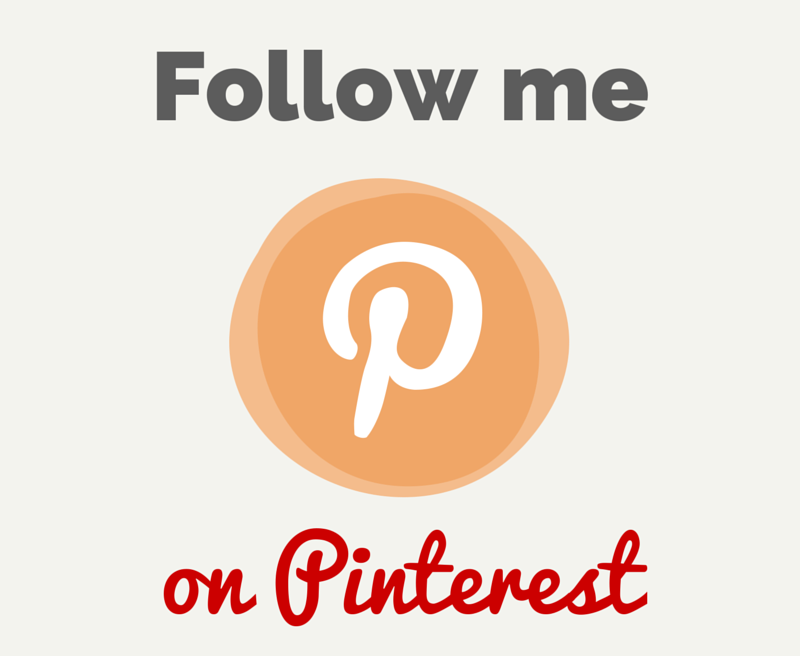 Oh, how I love Alaska weddings! There’s something about an Alaska bride. 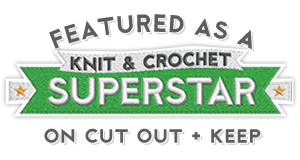 She loves to incorporate her home state into her most special day. Philly was no exception. 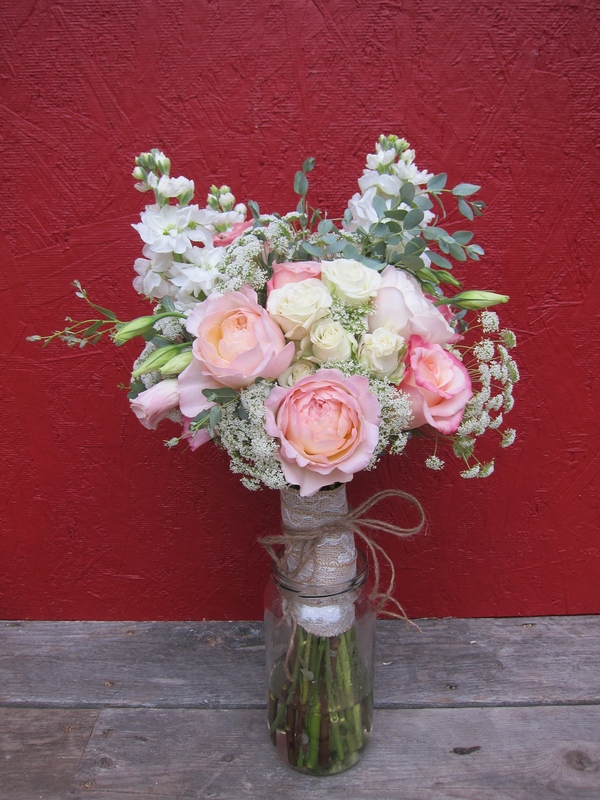 Her vision was simplicity for the bridal party and big and wild for the bridal bouquet. The photos can’t do this bouquet justice. There are peonies from every angle. The wholesaler’s peonies were small, but thanks to an old friend with a big peony garden, I was able to compensate with two HUGE blooms, which are what take up most of the photos. While snipping these two gorgeous flowers I sneaked a couple of poppy pods, which add some vintage green to the arrangement. I foraged many wildflowers including clover blossoms, yarrow, cow parsnip and grass berries. Wrapped in lace and twine and you’ve got a soft beauty with a twinge of wild. Utterly romantic.